By arming yourself with healthy food for the whole week, it’s easy to stay on track with your nutrition goals. Breakfast: Overnight oats with Shakeology for breakfast, with a different fruit each day. 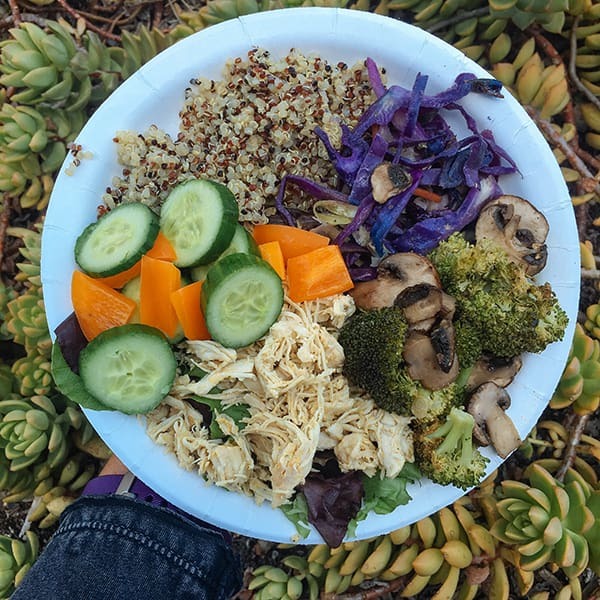 Lunch and dinner: Roasted vegetables, shredded chicken, hard-boiled eggs, and quinoa for a buffet-style meal prep fit for a queen. Throughout the week, you can mix and match the already-prepared food for quick and easy meals. Take a look below to see how can combine the food to make healthy, well-rounded meals. 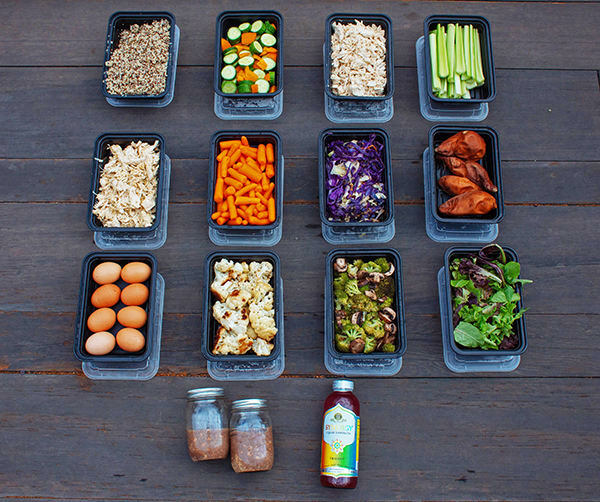 This is a 1,500–1,799 calorie level meal prep, but depending on your goals, you might need to eat more or less food. 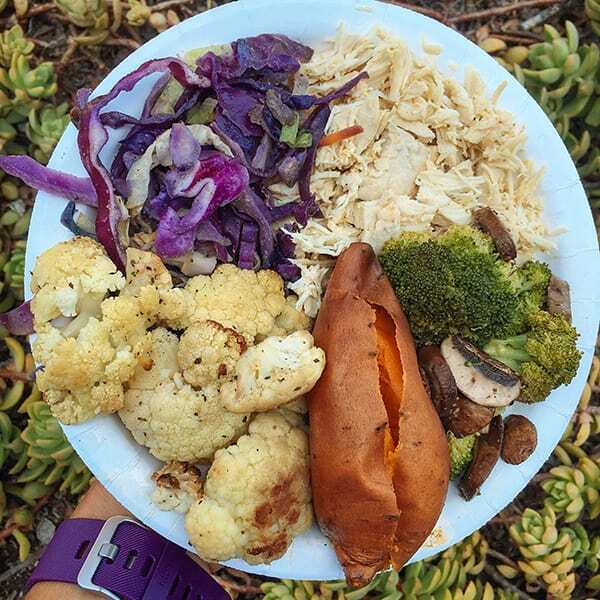 Follow your portion container plan to map out how you should fill your plate. A good rule of thumb for each meal is to have two to three containers such as a Green container (vegetables), a Red container (protein), and a Yellow container (carbs). With buffet-style meal prep, every meal can have variety. Mix and match the foods you want, when you want them. 1. Bake the sweet potatoes. Preheat your oven to 375°F. Scrub four sweet potatoes to clean them, then place on a large baking sheet. Cook the sweet potatoes for about 35 to 40 minutes, or until they pierce easily with a fork. When cool, place sweet potatoes in the refrigerator. 2. Roast the cauliflower, broccoli, and mushrooms. Turn your oven up to 450°F. On a large baking sheet, add 10 ounces sliced mushrooms and 12 ounces chopped broccoli. On another baking sheet, add 12 ounces chopped cauliflower. Drizzle with two teaspoons olive oil, and place in oven for about 30 to 40 minutes. Remove from oven and let them cool. 3. Chop a whole head of red cabbage. In a medium pan, heat two teaspoons olive oil. Add the chopped cabbage and cook for approximately 10 minutes, or until soft. 4. Place eight eggs in a saucepan, and add enough water to cover the eggs by one inch. Bring water just to a boil over high heat. Remove from heat, cover, and let stand for 12 minutes. While eggs cook, prepare a large bowl of ice water. Carefully remove the eggs from the hot water with a slotted spoon and transfer to the ice water. Place in refrigerator. 5. A rice cooker will make quick work of cooking the quinoa and will shut off automatically when it’s done. If you do not have a rice cooker, it can be cooked on a stovetop. Cook one cup of quinoa in two cups water and then set aside to cool. 6. To make the chicken, place a 16-ounce chicken breast into a pan with one cup low-sodium chicken broth (just enough to cover the chicken). Add two teaspoons of olive oil and desired seasonings. Bring to a boil and let simmer for 15–20 minutes. Cover and turn heat down to low. Continue to cook for another 45–75 minutes or until chicken shreds when you use a fork. Use two forks to pull the chicken apart. It’s easier to shred the chicken while it’s still warm. 7. Prepare the oatmeal jars. Set out five pint-sized mason jars. To each, add ¼ cup oats, one scoop Shakeology, 1 cup fruit, and water to mix. Cover and place in refrigerator. 8. Slice two cucumbers and two bell peppers. Drizzle with 1 or 2 teaspoons balsamic vinegar or sesame oil, (if you use sesame oil, be sure to count it toward your tsp — oils & nut butters), mix and refrigerate. 9. Cut a stalk of celery into smaller pieces and put into a container.